Former MoD UFO investigator Nick Pope has given candid answers to his beliefs on aliens. AN INVESTIGATOR who spent years pouring over the UFO phenomenon for the Ministry of Defence (MoD) has spoken exclusively to Express.co.uk about claims intelligent aliens are living here on Earth and the explosive story is covered up by world leaders. 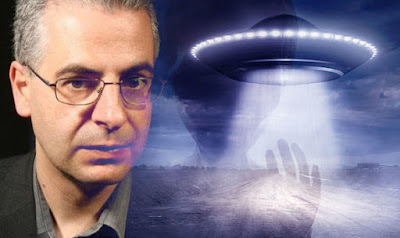 Nick Pope worked for the British MoD from 1985 to 2006, and between 1991 to 1994 ran extensive enquiries into any potential defence threat posed by the UFO phenomenon. The project was shut down with the conclusion there was no threat. Now based in the US, Mr Pope tours the globe speaking at UFO and alien-related conferences, as well as describing on documentaries what he has unearthed. However, when it came to revealing his true beliefs about whether intelligent aliens exist and are here on Earth - but hidden by a global cover up as thousands of conspiracy theorists and so-called truth seekers believe - Mr Pope has always played a close hand. For years alien believers have claimed the US Government, and possibly others, have encountered visiting aliens, and allowed them to operate unseen in hidden underground bases, from where they research our planet. In return for this, government’s assess the technology which allows them to get here. Various theories even suggest a vast array of species live here including reptilians, greys, and the human-like "Tall Whites" or Pleiadians. High profile believers have included the later NASA astronaut Edgar Mitchell and Paul Hellyer, a former Canadian Minister for Defence. Express.co.uk asked Mr Pope to come clean about his view of this and other theories for the first time, and he did not hold back. The 52-year-old revealed he is convinced aliens exist, somewhere out there in the Universe. However, in a blow to alien hunters, he said he is NOT satisfied there has been any "smoking gun" evidence that any have ever visited Earth. And, he categorically said he does NOT believe ANY of the conspiracy theories about aliens secretly hidden in top-secret bunkers and working with global governments. Scientifically, he is not convinced that aliens could even make it to Earth. If there are any UFOs arriving from other planets, they "would only be automated probes or craft controlled by artificial intelligence," he added. We quizzed Mr Pope in the wake of last month's revelations that the US Department of Defence (DoD) had been engaged in a top-secret project to look at the potential threat of UFO from 2007 to 2012. The US had previously denied any interest in UFOs since the 1960s, but the Pentagon has now confirmed the existence of the Advanced Aerial Threat Identification Program (AATIP). Mr Pope said: "Like most people who take an interest in the UFO phenomenon, I've thought carefully about my beliefs in the light of the recent revelations concerning the Pentagon's UFO project. "The story was undoubtedly a major one. The US government had consistently stated they had no interest in UFOs and that UFO sightings weren't being investigated. "We now know that there was official interest, and that sightings were being investigated. "Moreover, the Pentagon's AATIP project had amassed some intriguing evidence: testimony from military witnesses, videos of military jets chasing unidentified objects, and alloys and other materials that it's claimed came from unspecified UFO incidents." He said some of the people involved with this Pentagon project came to believe that a number of these unidentified objects were extraterrestrial in origin. Mr Pope added: "This is a big deal, and should lead to a reframing of the debate about UFOs. For the time being, however, there's still no smoking gun. "In many ways AATIP was no different from the British government's UFO project, which I ran in the Nineties: we too had numerous cases with military witnesses; we had photos and videos - on occasion taken with gun cameras from RAF jets; and from time to time we discussed the possibility that some of these sightings might be extraterrestrial in origin." So where does that leave him on the issue? He said: "I still can't rule out that possibility, and I'd love it to be true: the world would be far more interesting with aliens than without them. "However, while I've seen some intriguing evidence, I've yet to see any definitive 'you can take it to the bank' proof. "So the bottom line is that while I'm sure there's life elsewhere in the universe, I don't know whether or not we're being visited. "If we are, I suspect we're dealing with automated probes, or craft operated by some sort of artificial intelligence. "Even if there are flesh and blood aliens out there somewhere, the cosmic radiation and the immense time required to travel interstellar distances probably rules out biological lifeforms making such journeys - unless there's a way around what seems to be the absolute barrier of light speed." Mr Pope said for the time being, concepts such as warping spacetime or using wormholes "are science fiction and not science fact, so if we're being visited by extraterrestrials, we're probably dealing with machine intelligence and not biological entities”. Mr Pope added: "I don't believe any of the conspiracy theories that say aliens are already here on Earth, and that they're secretly working with various governments."